Improved liver function can directly affect your weight loss success. Imagine shedding pounds without diets or calorie counting. Learn how to increase your metabolism, shed extra pounds, and improve your health. First we need to understand how this important organ works and why it's function is so strongly connected to weight loss. The liver is also responsible for the secretion of bile, which is a fluid that is stored in the gallbladder and is released as it is needed for digestion. Proper Bile production is necessary for good digestion. Bile helps our bodies to break down and digest fat. It also stimulates the digestive system, which helps prevent constipation. Bile has other functions too like the absorption of calcium and certain vitamins. The liver dumps toxins into the bile so they can be eliminated from the body. If your liver becomes overloaded then so does the amount of toxins that the liver dumps in the bile. Our bile becomes so clogged that it just can’t function properly anymore. It becomes so thick from being mucked up that it becomes very inefficient in breaking down our fat. The sad outcome is weight gain. 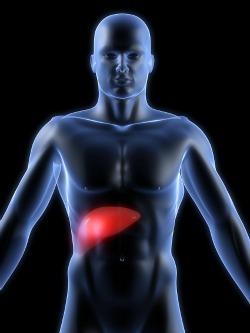 Another liver task is to regulate the body’s hormones and metabolic rate which are also linked to weight loss. You see metabolic rate (metabolism) is regulated by the hormones from the thyroid gland. If our livers are sluggish and overloaded the chances are your metabolism will also be sluggish. When your metabolism is running at peak performance your body knows exactly what weight it should be and how to get there. If your liver is sluggish and overwhelmed, achieving your healthy body weight will become extremely difficult. Keeping this organ healthy is also the best way to avoid fatty liver disease which is becoming more common due to the rise in obesity rates. Try to incorporate more healthy food choices daily, especially the liver loving foods which are easily attained with a variety of vegetables. How about rewarding yourself with a bowl of homemade soup on a daily basis? Soups are a magnificent way to lose weight and the variety of recipes you can make is endless which helps keep the taste buds satisfied and the meals exciting. Try eating or drinking some of these foods in their raw form. It can be as simple as eating a bowl of coleslaw or perhaps making a fresh glass of juice? There are many juicing recipes you can choose from. Enjoy a juice fast or a raw food fast to help detoxify the body. That would be a diet that is low in protein and high in carbohydrates and fats. Avoid fried foods, saturated fats, junk foods, processed foods, refined white flour products and white sugar products. These types of food have been depleted of natural vitamins, minerals and enzymes. Overeating is probably the most common cause of liver malfunction. It creates excess work for the liver, resulting in liver fatigue. In addition, the liver must detoxify all of the various chemicals present in our food supply today. When the liver is overworked, it may not detoxify harmful substances properly. Stimulants such as coffee, chocolate, white sugar, alcohol, artificial sweeteners and tobacco. They do stimulate us but provide no benefits, they just overwhelm the liver. Alcohol is particularly toxic to the liver when consumed in excessive amounts. The liver begins to lose its functioning capacity. By improving liver function you will achieve more than just weight loss, you will start to cleanse your body, mind and spirit.